Created by popular demand, Ultimate Jumpers, Inc. now manufactures gymnastics equipment! Our durable Inflatable Gymnastics Tumble Track for Sale is the newest addition to our inflatable unit inventory. The inflatable gymnastics tumble track for sale is a great way to have the athletes practice. 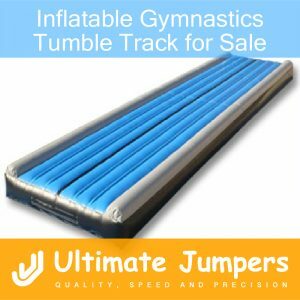 In fact, the inflatable tumble track can travel with you to your gymnastics competitions. In addition, size and color modifications can be made to the inflatable tumble track. Ultimate Jumpers, Inc. carries amazing warranty deals on their inflatable units. They use high quality equipment to cut and sew their inflatables, ensuring accuracy and efficiency. Also, they use top quality, ASTM material for all of the inflatable products, which is 18.5 oz. PVC Vinyl. Designers make sure the models are new and up-to-date, to make sure kids have the most fun possible. Customers can take advantage of the live chat option on the website with any questions or concerns. Furthermore, products can be viewed online, or through the company catalog which can be requested here. Finally, One of the best services provided by UltimateJumpers.com is their option for financing. Financing lets you pay for your purchase with small, manageable payments. Apply for financing here. Finally, all inflatable units manufactured by Ultimate Jumpers are made with safety requirements in check.